I n 1493 the first Iberian cattle were introduced into Hispaniola by the Spaniards. These were the first cattle in the new world. These cattle were necessary to plow the fields and provide milk, meat, and cowhide for clothing, rope, construction of houses and corrals. 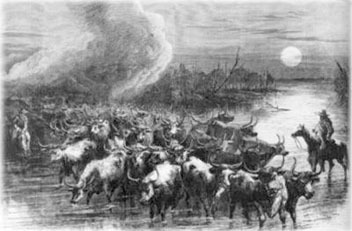 The demand was greater than what could be transported and on January 30, 1494, Christopher Columbus wrote to King Ferdinand and Queen Isabella about the need of these cattle for the survival of the colonists. Eventually, these cattle made their way to South America, Mexico, and what was to eventually become the state of Texas. The Iberian cattle proliferated in the warm environment with lush forage. By 1512, there were so many Iberian cattle in the Caribbean Islands and South America that the need for more cattle from Spain and Portugal was eliminated. Thus, the gene pool was effectively closed in 1512 with these cattle descended from the original Spanish and Portuguese stock. What eventually became the Longhorns were cattle that came from Mertolenga in Southern Portugal. These cattle were noted for calving ease and ability to survive under harsh conditions. Texas Longhorns are famous for these two traits. The Mertolenga have three fixed color types: dark red over the entire body, a white body with red spots and red heads, necks, and lower legs; and what the Portuguese call “a thousand flowers.” In Texas, the latter is referred to as reddish brown and speckled. Genetic testing, however, has shown that the true Texas Longhorn is a cross between the Mertolenga from Portugal and the Andalusian cattle from Spain. The Texas Longhorn, more than any other factor, was the key to the survival of Texas. It has been estimated that the ten million Longhorns driven to northern markets between 1866 and 1895 were worth approximately Two Hundred Million Dollars. It was money that enabled Texas to survive the Civil War. But what led to the success of the Longhorn (money) almost destroyed them. 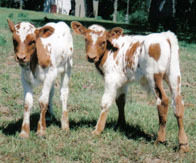 Ranchers soon learned that if they crossed the Longhorn with an English breed from the British Isles they could produce a heavier crossbred offspring and still retain the characteristics of the original gene pool: calving ease, disease resistance, low maintenance, and the ability to survive without the assistance from man! In short they got more money, pound for pound, for the crossbred offspring. In the early 1900s a handful of ranchers cared enough to locate the best of the surviving Longhorns and place them in specific herds. Through thoughtful breeding practices and ruthless culling of impure specimens, the Longhorns were restored to their former greatness. This is not new story but one that is old as man managing animals for sale and the practice is an ongoing story in most breeds of cattle today. It’s about money. There are certain family names that stand out in the preservation of the Longhorn: According to Darol Dickinson of the Dickinson Cattle Company and the expert on the — THE TEXAS LONGHORN. Longhorn cow and bull acknowledges 7 families of Texas Longhorn. They are Yates, Marks, Phillips, Butler, Peeler, Wright, and WR (from “Wildlife Refuge” in Oklahoma where Hatton & Barnes initiated a gov’t maintained herd). For fascinating reading about Texas history and the Longhorn I recommend Gathering Texas Gold by J. Frank Dobie. Today, the Texas Longhorn can be found in all 50 states. Its rapidly increasing popularity can once again be attributed to the traits it has maintained throughout its history: calving ease, resistance to disease, and independence from the assistance of man. Today we have Longhorn cattle of all colors and by the end of this decade we will see Longhorn bulls with 80 inch horns. I n our brief experience with Longhorn cattle we have observed a breed with unique personalities, incredible athleticism, and enormous beauty. It is sheer joy to take care of one of God’s most incredible gifts. 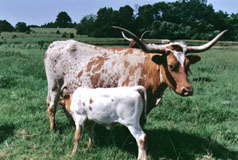 The combination of MESHACH and Joshua daughters produce offspring that carry the genes of 7 to 10 of the all-time greatest Longhorn Herd Sires (see the Texas Longhorn Journal—Herd Sire Issue, January 1996). The Texas Longhorn Journal published a survey taken from the longhorn breeders about the greatest longhorn sires of all time. Eleven made the list with a tie for 10th. These great herd sires are deceased but their genetic influence continues to be expressed in a better longhorn with more color and more horn. The pedigree of MESHACH (Senator) with Joshua daughters (Classic) is a winning and proven combination. MESHACH produces babies that not only have color, character, conformation, but also beautiful horns with a Texas twist. There are many advantages of longhorn cattle. They are self-sufficient — in other words, they don’t need your help. They have small-birth-weight babies so you won’t have calving problems. They eat forage that other cattle won’t eat. We have not had to use Round Up on our fence lines since their arrival. And finally, they have fantastic personalities — their agility at times resembles a prima ballerina. What a joy!